Neben der visuellen Schlafstadienanalyse ist auch eine Unterscheidung der Schlafstadien durch die Analyse der räumlichen Verteilung der Effektivamplitude im Elektroenzephalogramm (EEG) möglich. Dies erlaubt eine qualitative sowie quantitative Beurteilung der Schlafarchitektur. Ziel der Studie war es, die Auswirkungen pathologischer respiratorischer Ereignisse sowie der Tagesvigilanz auf die Mikrostruktur kortikaler Aktivität im Schlaf mit der EEG-Clusteranalyse zu untersuchen. 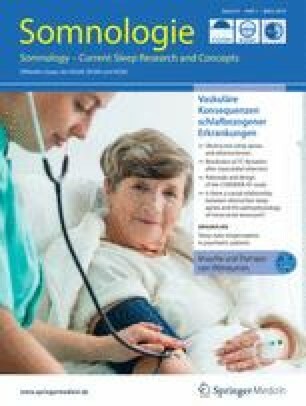 Bei 31 Patienten mit obstruktiver Schlafapnoe wurden kortikale EEG-Muster polysomnografisch aufgezeichnet und mittels EEG-Clusteranalyse ausgewertet. Anschließend wurden die Ergebnisse mittels linearer Regressionsanalyse mit dem AHI (Apnoe-Hypopnoe-Index) sowie der subjektiven (Epworth Sleepiness Scale) und objektiven (pupillografischer Schläfrigkeitstest) Tagesschläfrigkeit (TS) korreliert. Bei 18/31 Patienten wurden kortikale EEG-Muster während einer CPAP-Titration („continuous positive airway pressure“) in der Folgenacht erneut aufgezeichnet und mit der 1. Nacht verglichen. Es zeigten sich Zusammenhänge spezifischer kortikaler EEG-Muster mit dem AHI (Intra-Cluster-Abstand N2 [p = 0,019], N3 [p = 0,024]; Inter-Cluster-Abstand Wach-N2 [p = 0,046], Wach-N3 [p = 0,047], N2–N3 [p = 0,021]) und mit der objektiven TS (Wach-Intra-Cluster-Abstand [p = 0,047], Inter-Cluster-Abstand Wach-N3 [p = 0,042]). Insbesondere wurde eine Varianzzunahme der EEG-Muster bei Patienten mit hohen AHI-Werten festgestellt, die sich durch eine CPAP-Therapie reduzieren ließ. Dieser neue Ansatz ermöglicht die objektive Analyse und Visualisierung der Makro- und Mikrostruktur des Schlafs. Basierend auf der Varianz neuronaler EEG-Muster lassen sich somit Rückschlüsse auf das Vorliegen pathologischer respiratorischer Ereignisse und objektiver TS ziehen. Obstructive sleep apnea (OSA) is the most prevalent form of sleep-disordered breathing in the general population. It diminishes quality of life and is associated with many common comorbid conditions (hypertension, coronary artery disease, congestive heart failure, cerebrovascular accidents, cardiac arrhythmias, etc.) . Currently, the prevalence of OSA with an apnea–hypopnea index (AHI) ≥ 15 among 30–70-year-old adults is estimated to be approximately 13% of men and 6% of women . An overnight in-laboratory cardiorespiratory polysomnography (PSG) is considered to be the diagnostic gold standard for diagnosing OSA . Excessive daytime sleepiness (EDS) has been considered one of the cardinal symptoms of OSA and can result in reduced vigilance. The underlying pathophysiology in this regard is highly complex [6, 20]. Cortical arousals are observed near the end of the vast majority of obstructive events and therefore have a fragmentary impact on the macrostructure of sleep . The respiratory events lead to fragmentation of natural sleep and thus influence both its macrostructure and microstructure (e. g., cyclic alternating patterns; CAP) . In addition to the arousal index (AI) and sleep fragmentation, an increased AHI and low nocturnal oxygen saturation also seem to be responsible for increased daytime sleepiness. The most common form of therapy for all severity levels of OSA is nocturnal continuous overpressure respiration (continuous positive airway pressure, CPAP) . The introduction of CPAP therapy is known to cause a change in sleep macrostructure, especially during the first night, initially showing an increase in slow-wave sleep as a rebound phenomenon . In addition, changes in sleep microstructure, with a disproportionate reduction in arousal density and CAP, have been reported in the CPAP titration night in particular [5, 14]. As we could show previously, besides classical visual sleep stage scoring, it is possible to separate sleep stages solely by analyzing spatially distributed three-channel electroencephalogram (EEG) root mean square (RMS) amplitudes . This new approach allows qualitative and quantitative evaluations of sleep architecture. Qualitatively, the homogeneity or heterogeneity of spatiotemporal EEG patterns of a given sleep stage and the similarity or dissimilarity of such patterns between different sleep stages can be evaluated objectively . This methodology thus provides an objective analysis and visualization of both the sleep macro- and the sleep microstructure. The next logical step is to analyze and visually present the qualitative influence of CPAP therapy on the change of cortical EEG patterns. Furthermore, we aim to correlate the objective analysis of the homogeneity or heterogeneity of neuronal patterns with objective clinical parameters such as sleepiness, e. g., as objectively measured by pupillometry. The study was conducted in the Department of Otorhinolaryngology, Head and Neck Surgery, of the Friedrich-Alexander University Erlangen-Nürnberg (FAU), Germany, between March 2016 and November 2016, following approval by the local Ethics Committee (# 323_16 Bc). All 31 participating OSA patients (26 male, 5 female; median age 45 years, lower and upper quartiles: 37 and 57 years), were recruited by the Department of Otorhinolaryngology, Head and Neck Surgery. Inclusion criteria for the study were male and female patients aged between 21 and 80 years with untreated OSA according to the third International Classification of Sleep Disorders (ICSD-3; American Academy of Sleep ). Exclusion criteria were a positive history of misuse of sedatives, alcohol, or addictive drugs, or other untreated sleep disorders. All patients were asked to fill out the Epworth Sleepiness Scale (ESS) before the first night of cardiorespiratory diagnostics. In the morning after the cardiorespiratory PSG, objective assessment of vigilance was carried out. In the subsequent night, CPAP titration was performed. Data analysis was carried out during time in bed (TIB) of the cardiorespiratory diagnostic night, accumulating to a total recording time of 276 h and 12 min. In 18 out of 31 patients, CPAP titration was performed in the subsequent night, summing up to a total sleep time of 153 h and 48 min. Patients used the CPAP mask during the complete time in bed. PSG was carried out using the 33-channel cardiorespiratory SOMNOscreen diagnostic system (SOMNOmedics, Randersacker, Germany). Technical implementation of PSG followed the American Academy of Sleep Medicine (AASM) recommendations using standardized procedures including an EEG (F4-M1, C4-M1, O2-M1), right and left electrooculogram (EOG), electromyogram (EMG) of the mentalis and tibialis muscles, a nasal respiratory flow sensor (nasal pressure cannula), thoracic and abdominal respiratory effort sensors (induction plethysmography), body position sensors, pulse oximetry, snoring microphone, a one-channel electrocardiogram (ECG), and infrared video recording . For EEG recording, impedances were kept below 5 kΩ and data were sampled at 256 Hz with high- and low-pass filters at 0.2 and 35 Hz, respectively. Minimal digital resolution was 16 bits per sample. ECG signal elimination was performed for M1. The sleep stages (wake; N1; N2; N3; rapid eye movement, REM) were analyzed and scored visually in 30 s epochs, and associated events were scored according to the AASM criteria (version 2.1, 2014). Scoring was conducted by a highly trained sleep specialist accredited by the German Sleep Society (DGSM) [1, 7]. Thereby, typical artifacts were marked and removed subsequently for further analysis and processing steps . In the night following cardiorespiratory PSG, CPAP titration was performed according to the clinical guidelines of the Positive Airway Pressure Titration Task Force of the American Academy of Sleep Medicine . Computerized evaluation of sleepiness was performed using the Pupillographic Sleepiness Test (PSTxsIII, AMTech Pupilknowlogy GmbH, Dossenheim, Germany). Spontaneous and involuntary pupil movements in darkness are hereby used to measure and evaluate central nervous activation objectively over a period of 11 min. Prior to measurement, subjects had to wear infrared goggles for about 2 min to adjust to the dark. The patients were seated on a chair and instructed to focus on a light-emitting diode in front of them. The pupillary unrest index (PUI) was calculated using an electronic pupillometer with video goggles and infrared illumination with the aid of customized software. The sampling rate was 25 Hz. Details of this methodology have been validated and published elsewhere [11, 18, 19]. Neurophysiological recordings, e. g., EEG, provide measures of neuronal activity evolving over time. Therefore, such data can be seen as a time series of amplitude values that can be broken down to one single value in a given time interval by RMS analysis. These single values recorded across the different recording channels during the same time bin reflect a spatial pattern of neuronal activity present at that time. The complete method has been described previously elsewhere [8, 9] but will be summarized here: The normalized RMS values of each single EEG channel were calculated for each 30 s epoch (synchronized to the sleep stage analysis). The RMS amplitudes of the three recording channels correspond to a three-dimensional vector for each 30 s interval, whereas successive vectors form a trajectory in three-dimensional space. Each point was labeled with the corresponding sleep stage (cluster labels). A newly developed method was then applied to statistically compare these clusters of data points in n-dimensional space. It is based on calculating the so-called discrimination value, taking into account all intra- and inter-cluster distances between each pair of data points in n-dimensional space. These distances are a measure of how similar or dissimilar two points (i. e., EEG activation patterns) in n-dimensional space are. The more similar they are, the smaller their distance [8, 9]. The intra-cluster distance within each sleep stage corresponds to the variance of neuronal patterns within this stage. The inter-cluster distance between the sleep stages corresponds to the dissimilarity of the neuronal activity when comparing these conditions. The processed data were analyzed with Statistica 8 (StatSoft, Inc., Tulsa, OK, USA). 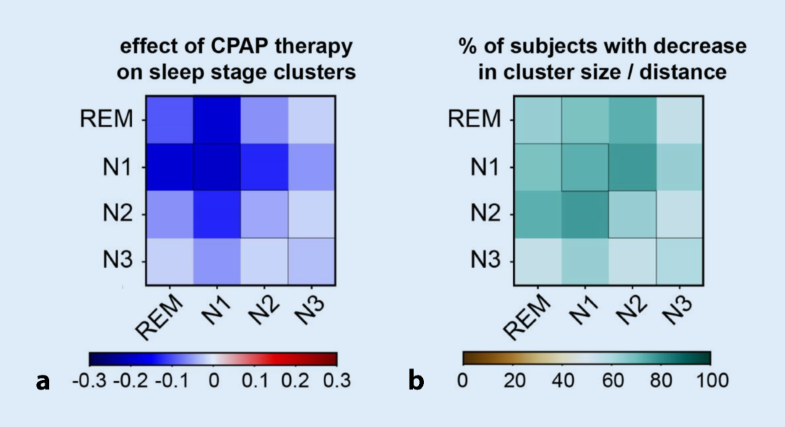 For the datasets of the 31 patients obtained before CPAP therapy, multiple linear regression analyses were performed with the ESS, PUI, and AHI data and the different neuronal pattern cluster radii and distances independently. The results of these regression analyses are summarized in Table 1 and 2. Note that in the ESS analyses no significant correlations were found and the results are not shown in detail. Total sleep time, AHI, and number of epochs of each sleep stage before and after CPAP therapy were analyzed with paired Wilcoxon tests in the 18 patients for whom measurements were obtained during CPAP titration. For comparison of the neuronal patterns pre- and post-CPAP therapy, we calculated the individual change of intra- and inter-cluster distances during each sleep stage (CPAP night value minus untreated night value) and the percentage of patients showing either an increase or decrease in these parameters. The number of nocturnal respiratory events per hour (median AHI 19.0; lower and upper quartiles 10.4 and 36.5) was obtained from 31 patients with OSA (26 male; median age 45years; median body mass index, BMI: 27.3 kg/m2) and correlated with the cortical EEG patterns recorded during sleep. Five significant positive linear correlations (Table 1) of sleep stage EEG patterns with the AHI were found (N2intra, N3intra, wake–N2, wake–N3, N2–N3) as well as three tendencies for positive linear correlations (wakeintra, wake-REM, wake–N1). These correlations indicate that an increase in AHI (i. e., the severity of the OSA) and pathologically changed cortical EEG patterns occur together. These EEG pattern changes are most prominent in intra- and inter-cluster distances (i. e., the heterogeneity within a pattern and the dissimilarity between patterns) of sleep stages N2 and N3 and the wake stage. Subjective daytime sleepiness was obtained by the ESS questionnaire in all 31 patients and correlated with the cortical EEG patterns recorded during sleep. The results of the multiple linear regression analyses showed no correlation of subjective sleepiness with any of the recorded neuronal patterns. Objective daytime sleepiness was measured in the form of PUI. The results of the multiple linear regression analyses of PUI with the cortical EEG patterns are given in Table 2. 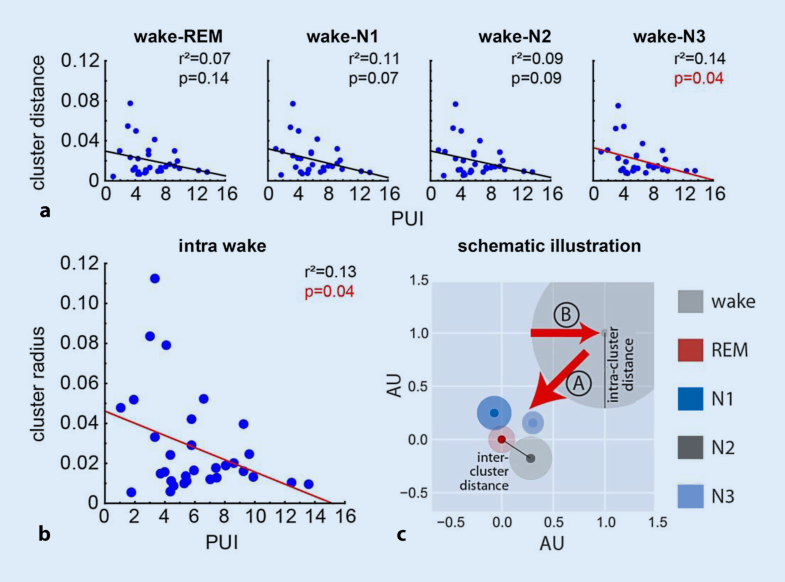 In two cases we found the objective sleepiness to be significantly negatively correlated with the intra-cluster distance of the wake state (wakeintra) and the inter-cluster distance between the patterns of wake and sleep stage N3 (wake–N3), respectively. Additionally, in two other cases we found tendencies for negative linear correlations of the PUI with the inter-cluster distance between wake and N1 (wake–N1) or wake and N2 (wake–N2) patterns (Fig. 1a, b; Table 2). In other words, a decrease in patients’ vigilance (increased PUI) leads to homogenization of wake stage simultaneously with a shift of the wake stage towards the sleep stages N1, N2, N3, and REM (Fig. 1c). In 18 out of 31 patients a CPAP titration was performed during the subsequent night. Median total sleep time was not changed significantly with CPAP therapy compared to pre therapy (TSTpre = 8.9h, interquartile range [IQR] 8.3–9.7h; TSTCPAP = 8.5h, IQR 7.9–9.4h; paired Wilcoxon test, p = 0.08). 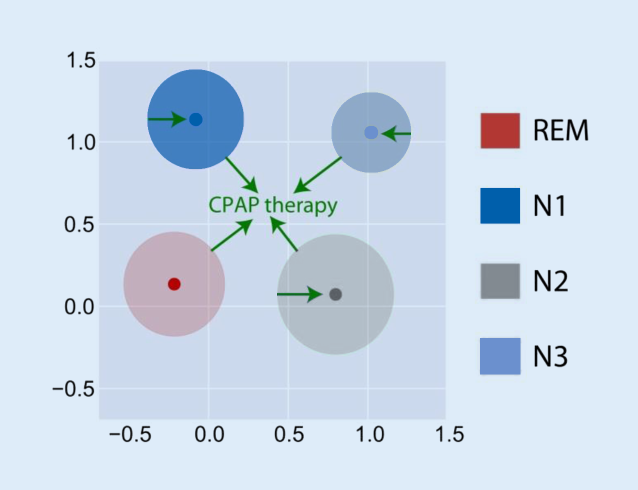 CPAP therapy significantly reduced AHI (Fig. 2a; paired Wilcoxon test, p < 0.001; AHICPAP = 8.3 [4.9, 17.2]) and significantly changed the number of wake and sleep stages (Fig. 2b). From the results of the AHI–EEG pattern correlations we expected the pathologically increased intra- and inter-cluster distances to be reduced back to normal when the AHI decreases (Fig. 3). The real effect of CPAP therapy on cortical EEG patterns during the different sleep stages is depicted in Fig. 4. The paired change of the median value (CPAP night minus untreated night) of inter- and intra-cluster distances between all combinations of sleep and wake stages is given in Fig. 4a. Note that only decreases of inter- and intra-cluster distances were found (blue colors), and that this was true for most sleep stage combinations tested. In other words, with CPAP therapy, cortical EEG patterns during sleep show less variation and therefore a higher homogeneity. This was particularly true for the intra-cluster distances of all sleep stages which showed reduced heterogeneity of EEG patterns during CPAP therapy. With respect to inter-cluster distances, EEG patterns associated with the different sleep stages became less different during CPAP therapy as well. Fig. 4b gives the percentage of patients showing a decrease in the cortical EEG patterns. Most patients (up to 80%) showed a decrease in inter- and intra-cluster distance in N1intra, REM–N1, REM–N2, and N1–N2. Taken together, these data show, that CPAP therapy not only has a positive effect on breathing but also affects brain activity during sleep. The cortical EEG patterns during the different sleep stages become more homogeneous already during the first night of therapy, thereby presumably resembling the EEG patterns of healthy subjects. As has already been shown previously, it is possible to discriminate sleep stages solely on the basis of spatially distributed cortical activity patterns by means of RMS amplitudes . However, the potential of this methodology goes beyond the possibility of isolated sleep stage analysis. In addition to statements on qualitative as well as quantitative aspects of sleep architecture, these differences can now be objectively analyzed with the help of so-called multidimensional cluster statistics (MSC; ). Graphic representation of the individual sleep stages in the form of clusters (measure of the similarity/dissimilarity of cortical signal patterns) also enables a novel form of visualization of sleep architecture including the microstructure of sleep. The size of a respective cluster (intra-cluster radius) represents the similarity/dissimilarity (homogeneity or heterogeneity) of the cortical patterns associated with a particular sleep stage. The position of the individual clusters relative to one another (inter-cluster distance) describes the similarity/dissimilarity of the cortical patterns between the individual sleep stages. In addition, the clusters (intra-cluster radius and inter-cluster distance) of the sleep stages N2 and N3 can be used indirectly to draw conclusions about respiratory events (in the form of the AHI). The higher and thus more pathological the AHI becomes, the more different (inter-cluster distance) and non-uniform (intra-cluster distance) become the clusters of the sleep stages N2 and N3 (see Table 1). The intra- and inter-cluster distances of N2 and N3 can thus be used as an indirect measure of the severity of obstructive sleep apnea. 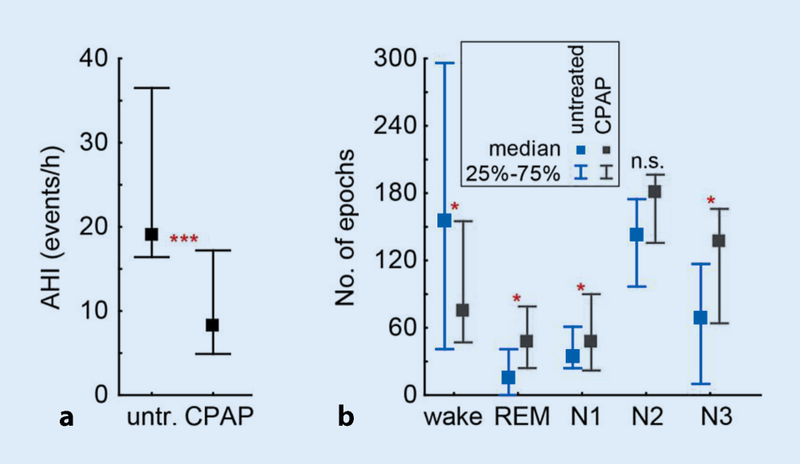 In turn, however, it can also be shown that the use of CPAP significantly changes neural EEG patterns and thus obviously homogenizes sleep microstructure. However, this homogenizing effect has currently only been demonstrated for the CPAP titration night. In addition, with the aid of this novel method, statements can be made about frequently accompanying daytime symptoms—at least with regard to objective daytime sleepiness in the form of (tonic) central nervous activation. The lower the central nervous activation (in the sense of a pathologically increased PUI) the more similar becomes the cortical EEG pattern of the wakefulness (in the directly preceding PSG measurement) to sleep stage patterns of N1, N2, and N3. Despite some underlying logic, this causal link needs to be further explored in the future. The fact that the subjective sleepiness in the form of the ESS does not correlate with cortical EEG patterns seems unsurprising. The general data on the association of ESS with objectively measured daytime sleepiness are still largely inconsistent in the literature . While the ESS refers to a longer period before the questionnaire survey, the neuronal EEG patterns represent only a snapshot of an isolated PSG night. In addition, a divergence between subjectively percieved and objectively measured sleepiness is often observed, not least because of the diverse vocabulary for the feeling of drowsiness (sleepiness, tiredness, unrested, drowsiness, fatigue, etc.) [6, 20]. In addition to the possibility of an objective evaluation, this novel methodology also enables visualization of sleep macro- and microstructure. In addition, the variance of neuronal EEG signaling patterns can be used to draw conclusions about the presence of pathological respiratory events. Furthermore, a correlation between nocturnal cortical EEG patterns and objectively measured vigilance (tonic central nervous activation) can be established to analyze excessive daytime sleepiness. With the help of this novel approach, a variety of other future applications also arise. A fully automated and objective method of sleep stage classification with much higher temporal resolution without relying on discrete 30 s epochs could enable an adaptive scoring system. We are grateful to Fabien Isbrecht for technical assistance. M. Traxdorf, P. Krauss, A. Schilling, H. Schulze, and K. Tziridis declare that they have no competing interests. All procedures performed in studies involving human participants were in accordance with the ethical standards of the institutional and/or national research committee, including approval by the local Ethics Committee (# 323_16 Bc), and with the 1964 Helsinki declaration and its later amendments or comparable ethical standards. Informed consent was obtained from all individual participants included in the study.